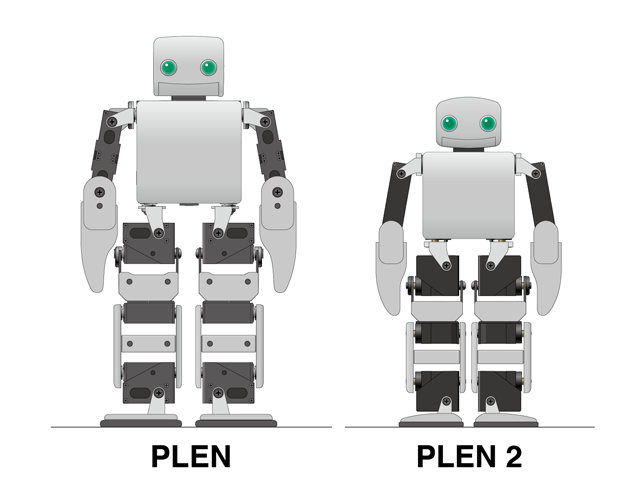 PLEN2 is designed to take advantage of the modern era of “personal manufacturing” to produce a new robot that’s even smaller, lighter, more capable, and more adorable than the original. PLEN2 will embrace open-source hardware, and is designed to be highly customizable by the user. The robot can be programmed via the Arduino IDE, and controlled from any Bluetooth-capable iPhone or Android device. Despite being posted on a crowdfunding site, the company is not asking for any money at this time. Instead, they are requesting input from potential users. They’re looking or requests such as, “I want to this sort of accessory,” or “I like a robot that looks like such-and-so!” Because PLEN2 is still in the prototyping stage, the company explains, it can benefit from various ideas like these from the community. There’s no word yet on pricing or availability. The original PLEN was certainly at the high end of the price scale, especially for its size, although it did have impressive performance to match. One can hope that with 3D printing, open-source hardware, and the steady advance of technology, PLEN2 will be more affordable and even more capable. In any case, given the amazing movements and behaviors of its predecessor, we can be sure that PLEN2 will be one adorable (and impressive) robot.